In addition to the EV200, BAIC has also introduced a petrol-powered version called the BAIC D20. Despite all the hoopla surrounding its electric cousin, this is actually closer to hitting showroom floors in 2017 – with prices set to be announced soon – and has already received Energy Efficient Vehicle (EEV) status from the government. Locally-assembled (CKD) at the company’s plant in Gurun, Kedah as part of a joint venture with local partner Amber Dual, the D20 is said to be based on the first-gen smart forfour, with styling derived from the original Mercedes-Benz B-Class. Unlike the EV200 sedan, however, the D20 is a five-door hatchback. 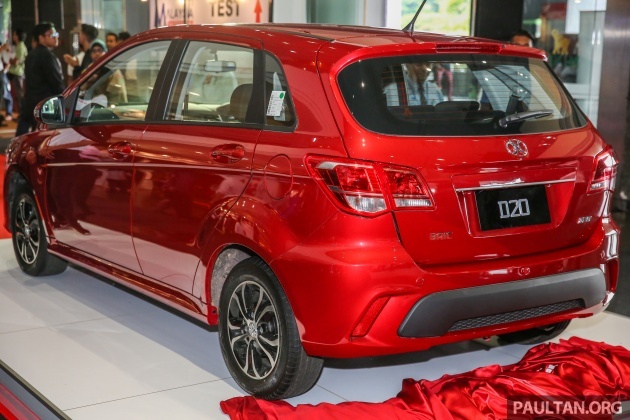 As with its twin, the Malaysian-spec version of the D20 is the brand’s first right-hand drive car. As for what’s under the bonnet, the D20 ditches the EV200’s electric motor for a choice of two four-cylinder petrol engines. The 1.3 litre mill produces 101 hp and 128 Nm and is only available with a five-speed manual gearbox, while the 1.5 litre version kicks out 114 hp and 148 Nm and also has a four-speed automatic option. The D20 comes in Comfort and Fashion variants, with the 1.3 litre variant only available in the former. The 1.3 litre model comes with 14-inch steel wheels with covers, while the 1.5 litre models all get alloy wheels as standard. The more powerful models also get an anti-UV windscreen, and only the Fashion models gain a sunroof. Inside, all models get fabric seats, power-adjustable wing mirrors, digital air-con controls and a proper gearlever instead of the EV200’s Jaguar-esque rotary selector. The 1.5 litre variants receive a height-adjustable driver’s seat and a split-folding rear seat (the 1.3 litre’s folds whole), while the Fashion models benefit from sun visor mirrors, heated and power-folding door mirrors and automatic lights and wipers. 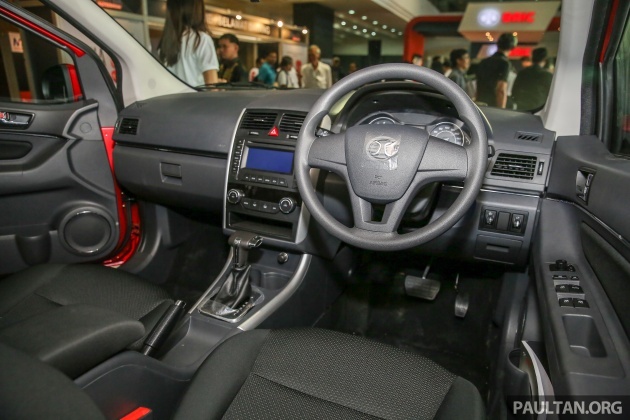 In terms of infotainment, all models get a CD/radio head unit with USB and AUX ports, with the Fashion getting multifunction steering wheel controls and a 6.5-inch touchscreen navigation system option as seen here, plus an optional reverse camera. Safety-wise, all cars get dual airbags, ABS with EBD and ISOFIX child seat anchors, while the Fashion gains a passenger-side seat belt reminder. 1st gen fourfour based on Mitsu platform. So… jepunis reliability,right? Soon China cars will be flooding our market. This is because of our “unofficial agreements” we have made with China. 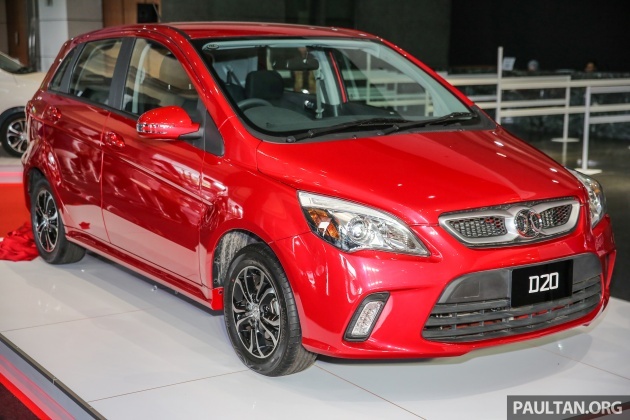 With China cars flooding our market, you will see Proton’s demise sooner. inb4 kilang Inokom quality TerBaikkk..
how can an ageing platform and powertrain granted EEV status…!? the least that they can do is clean up the engine bay, so dusty and full of dirt ,goddamn dis ppl are so lazy…..
101hp for 1.3 engine? That’s higher than our local 1.3 car. There is an electric motor assisting it. Don’t believe engine output provided by China ppl, always under punya. Banyak motor underpowered and running on high loads. State of the art teknologi transfer. I more worried about the safety rather than the engine. Hey , we’re even buying naval defense from chis now. Why the worry over quality. Uncle Najib has endorsed it. Much more powerful than jepunis engine, you dun mention pulak. If technology exchange and CKD, reliability wont be a major issue. Bcoz Chinese reliability comes down to how much the manufacturer wants to save on materials/QC/QA. Their technology is actually top-notch (you can’t just copy an iPhone, you need to understand how all of it works together). Just that they can’t be trusted to not be cheapo about putting it together. If our guys are putting it together, expect P1/P2 quality. Suprima has different shape and more aerodynamic look. I doubt its EEV status. Those planing to get one, please conduct your own test. If it fails to meet requirements. You would likely be a millionaire soon. EEV status is based on it having an EV equivalent. Thereby granting EEV status for the petrol siblings as well. Boy, what a pain reading about how much more power the engine makes. This is 2016, making peak engine power is the least of the concern, what is more important is the smoothness of the power curve and the reliability of the engine – that takes real skill and experience in terms of engine design and fuel programming. Another startup using a “mirage” EV variant to get reduced tax EEV status for all of its cars. They would make money by selling the petrol version at very minimum tax, and not expecting anyone to buy the EV version. Oh God! Dunno what to say. this batch hard to sell yo. At least it has 1 thing better than Japanese B segment. At the least, it has a temperature gauge. These days Japanese B segment does not come with it. Just an indicator light to tell you whether the engine is overheat or not.